The Fairmont Mayakoba in Riviera Maya, Mexico is an extraordinary 45-acre tropical resort located alongside the gorgeous Caribbean coastline. Just 30 miles from the Cancun International Airport, the Fairmont offers easy access to an abundance of accommodations that make for the ultimate Mexican excursion. Moreover, over the years the Fairmont has earned itself several awards for its outstanding standards. Read below all you need to know about this luxurious resort. The Fairmont Mayakoba consists of 401 sprawling rooms and suites, many of which are modernized Casita rooms, or small freestanding suites. 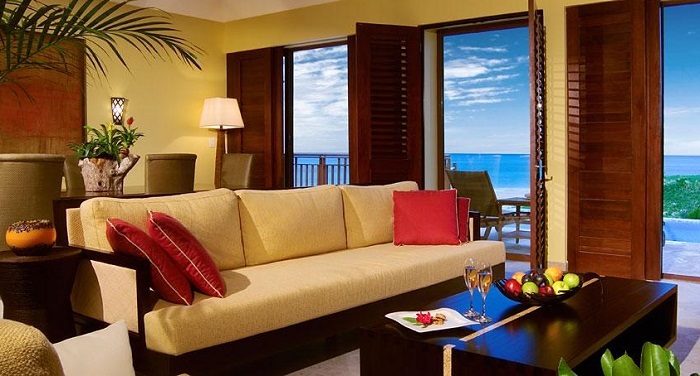 Most suites come with their own spa-like bathrooms and private balconies. Moreover, beyond the beauties of the hotel’s interior, guests will discover a wealth of natural wonders, including white sand beaches, nature trails, lush tropical forests, freshwater rivers, underwater caves, and the pristine blue waters of the Carribean sea. Since the hotel’s construction, Fairmont management has shown its dedication and respect for its natural surroundings. From utilizing ancient Mayan planting techniques to caring for native animals and birds, the hotel is constantly seeking ways to be more environmentally-friendly. Previously, the Fairmont’s exceptional accommodations have attracted celebrity guests such as Pamela Anderson and Greg Norman. 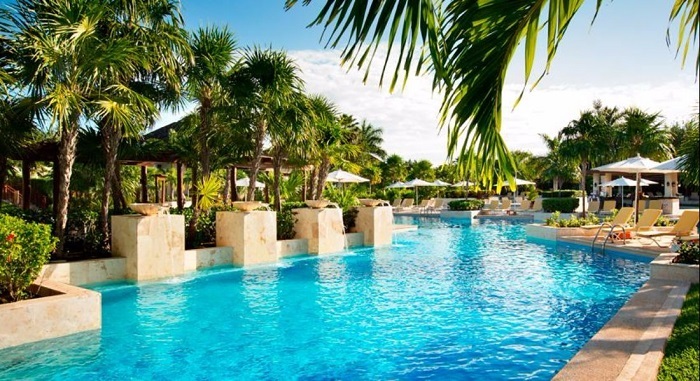 The Fairmont Mayakoba offers guests a wide range of onsite dining and spa facilities, as well as a golf course and pools that are woven skillfully into the natural landscape and provide endless hours of relaxation and enjoyment for the whole family. For guests looking to experience all four of the resort’s restaurants, the Premium Appetite for Luxury dining package is an ideal dining option. Brisas Restaurant: Brisas offers world-class Mexican food prepared by Chef Richard Sandoval and served beachside. El Puerto Restaurant: Puerto is a four-star Latin-Asian restaurant with an expansive drink menu. La Laguna Restaurant: This is the place for Mexican-inspired breakfast, lunch, or dinner. Guests will also find an abundance of live music at this open-air restaurant and lounge. Willow Stream Spa: The onsite spa offers services in three categories: Relieve, Restore, and Results. 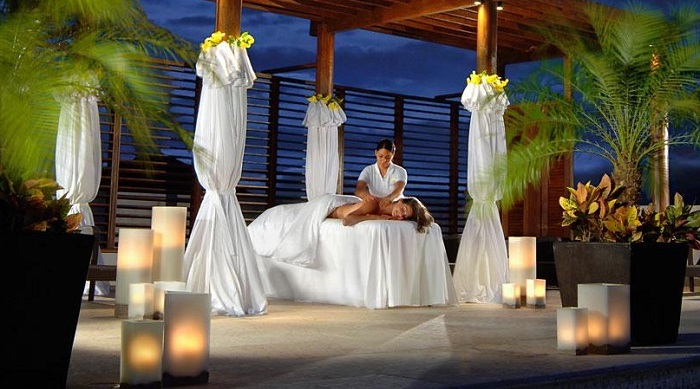 The Fairmont Mayakoba offers a number of complimentary activities designed to make each guest’s stay magnificent. For starters, kids eat free at any of the resort’s exclusive restaurants. Moreover, children gain three hours of complimentary access to the resort’s kids club each day. The hotel even provides complimentary kits for babies and toddlers. Each kit includes a variety of kid-friendly toiletries and a stuffed otter! There is also an onsite lounge for older children and teens. Guests will receive complimentary newspapers, free basic WiFi, tea & coffee service, and spa-style bathrooms to complete their stay. They can also utilize the full-service fitness center or one of five luxurious inground pools. For older children and teens, the 10,00 spare foot pool and water slide are a must. For young children, the designated play pool is just right. There is also an oceanside adults-only pool. Guests can also satisfy their craving for adventure by hiking or biking one of the resort’s trails or venture to the nearby underground taverns or Mayan ruins. The Fairmont has something for everyone! After arriving at the nearby Cancun International Airport, guests can utilize a variety of transportation options to quickly reach the resort. Moreover, to arrange a private transfer or discuss options, guests can contact the resort’s onsite travel agency or concierge. Also, guests can opt to utilize a taxi or rent a car, and all guests get free valet parking services. The El Camaleón Golf Course is an 18-hole golf course designed by professional golfer Greg Norman. Moreover, the beachside course is known for its gorgeous mangroves and limestone canals. It is also revered by many PGA tour professionals. Guests can book a tee time online. The Delphinus Riviera Maya offers an opportunity to swim with native Carribean dolphins. Delphinus is the headquarters for the Animal Welfare Program Delphinus for Research on Marine Mammals and is run by a dedicated team of marine animal experts. Dolphin excursions are available daily between 8:30 am and 5:00 pm. The Cenotes are vast underground caves that are filled with the water of freshwater streams. Xenotes Oasis Maya offers a $119 tour Monday-Saturday. Moreover, the tour includes transportation from the Fairmont, a visit to at least four cenotes, snacks & a full picnic lunch, as well as several adventure activities. Guests thoroughly enjoy snorkeling, zip lining, and tubing through these natural wonders. Blue Life Diving offers an amazing scuba diving experience for the whole family. For first-timers, Blue Life offers in-depth scuba lessons. Divers will accompany inexperienced scuba divers into freshwater cenotes or the tropical waters that surround Playa del Carmen. Moreover, Blue life offers a variety of three-day packages, starting at $335. Finally, the blue Carribean, mangroves, and underground caves provide a stunning backdrop for this modern, Mexican-inspired resort. On top of that, the Fairmont goes above and beyond to provide guests with spectacular, all-inclusive resort experiences. Whether traveling as a family, couple, or group of friends, the Fairmont Mayakoba has something to offer everyone. Also, next time you are in Mexico you can visit the Four Seasons Punta Mita as well. Have you recently stayed at this resort? Please share your opinions below.